On a cold March night in Seoul almost 600 years ago, Korean astrologers spotted a bright new star in the tail of the constellation Scorpius. It was seen for just 14 days before fading from view. From these ancient records, modern astronomers determined that what the Royal Imperial Astrologers saw was a nova explosion, but they had been unable to find the binary star system that caused it — until now. A new study published today by the journal Nature pinpoints the location of the old nova, which now undergoes smaller-scale "dwarf nova" eruptions. The work supports that idea that novae go through a very long-term life cycle after erupting, fading to obscurity for thousands of years, and then building back up to become full-fledged novae once more. A nova is a colossal hydrogen bomb produced in a binary system where a star like our Sun is being cannibalized by a white dwarf–a dead star. It takes about 100,000 years for the white dwarf to build up a critical layer of hydrogen that it steals from the sun-like star, and when it does, it blows the envelope off, producing a burst of light that makes the star up to 300,000 times brighter than the sun for anywhere from a few days to a few months. 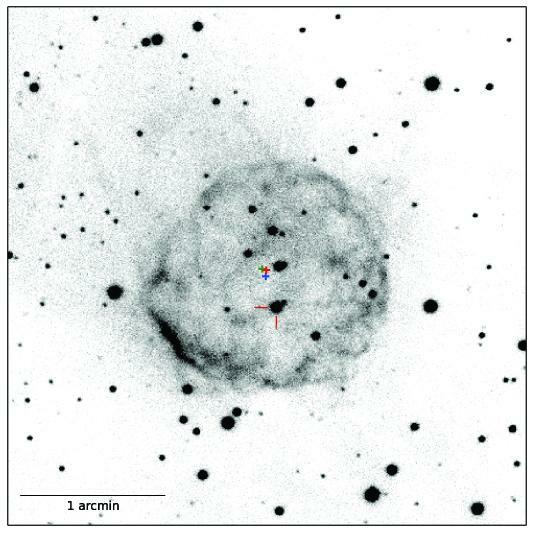 Other DASCH plates from the 1940s helped reveal that the system is now a dwarf nova, indicating that so-called "cataclysmic binaries"–novae, novae-like variables, and dwarf novae–are one and the same, not separate entities as has been previously suggested. After an eruption, a nova becomes "nova-like," then a dwarf nova, and then, after a possible hibernation, comes back to being nova-like, and then a nova, and does it over and over again, up to 100,000 times over billions of years. Funding for this study was provided in part by the Polish NCN grant #DEC-2013/10/M/ST9/00086, the National Sciences and Engineering Research Council of Canada, FQRNT (Quebec), and the American Museum of Natural History's Kathryn W. Davis Postdoctoral Scholar program, which is supported in part by the New York State Education Department and by the National Science Foundation under grant #s DRL-1119444 and DUE-1340006. The American Museum of Natural History, founded in 1869, is one of the world's preeminent scientific, educational, and cultural institutions. The Museum encompasses 45 permanent exhibition halls, including the Rose Center for Earth and Space and the Hayden Planetarium, as well as galleries for temporary exhibitions. It is home to the Theodore Roosevelt Memorial, New York State's official memorial to its 33rd governor and the nation's 26th president, and a tribute to Roosevelt's enduring legacy of conservation. The Museum's five active research divisions and three cross-disciplinary centers support approximately 200 scientists, whose work draws on a world-class permanent collection of more than 34 million specimens and artifacts, as well as specialized collections for frozen tissue and genomic and astrophysical data, and one of the largest natural history libraries in the world. Through its Richard Gilder Graduate School, it is the only American museum authorized to grant the Ph.D. degree and the Master of Arts in Teaching degree. Annual attendance has grown to approximately 5 million, and the Museum's exhibitions and Space Shows can be seen in venues on five continents. The Museum's website and collection of apps for mobile devices extend its collections, exhibitions, and educational programs to millions more beyond its walls. Visit amnh.org for more information.